The WorkCast studio is where presenters control event slides and connect their audio, webcam, microphone or share their screen. Users can also manage other event features such as questions and polls. The presentation is broadcast from the studio to the event auditorium for your attendees to view and interact with event features.. The arrow on the right hand side (image below) is the side menu where additional pod options are available to add to your view of the studio. Note: These details are event session specific. The session pin and user pin will change for every new event created. The studio contains a number of different pods. Each pod can be expanded, minimised or removed from the main section and returned to the sidebar menu where all your available pods are located. You also have the option of re-sizing all of the pods (excluding Media Hub) to display at your preferred size. The 'My Connections' tab allows you and your presenters to connect to the event via one of the options displayed in this tab. 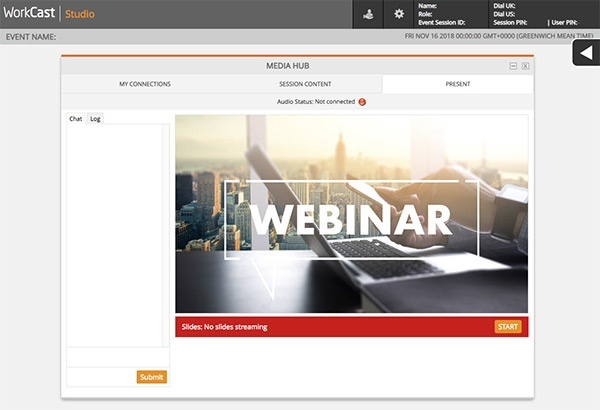 Depending on the 'presentation type' configured in the initial event setup prior to you loading the WorkCast Studio, depends on the connection options available for you and your presenters. Slides Only - Allows presenters to connect via phone bridge dial in or computer microphone and add presentation slides. Slides & Webcam/Full Screen Webcam - Allows presenters to connect via phone dial, just computer microphone or webcam with microphone and add presentation slides. Slides & Screenshare - Allows presenters to connect via phone dial in or computer microphone and flip between sharing their computer screen and event slides. Scheduled Replay/Simu-live - If you wish to connect to a scheduled replay event which would be streaming a recorded presentation at a set time you can connect via phone dial or computer microphone if you. This gives you the option to speak live during a section of the recording whilst it is playing to your audience should you wish to do so. You may wish to do a live Q&A or introduction which are use cases for this option. Presenters are able to present using either microphone or phone bridge. Phone - presenters can dial into the event via specified phone bridge details. This option is often preferable as it does not rely on the user's own internet connection and also provides consistent audio (the presenter may not have a good quality microphone). Presenters can hit * (star) on their phone to move to a private breakout room to speak to other presenters in private that does not broadcast to the audience. Microphone only - a presenter is able to connect their microphone to speak during the event and also hear any other presenters on the event no matter what audio option they have chosen. Webcam with Microphone - presenters can broadcast their webcam with webcam audio. Upload or choose your slides for the event and set the aspect ratio of the media. Slides can only be loaded if the session has not yet been started (start button pressed in the 'Present tab' of the Media Hub). Uploading slides to a session is a single-stage process; simply click Upload Slides, select your slides from your computer and they will be uploaded to the WorkCast platform. A 'loading' icon will display meaning the upload is taking place. 1) Select Upload Slides to load your slides to the platform. 2) Click Search Slides and choose the relevant slides from your library. Your event slides will be replaced with your selection. Note: slides upload time can vary depending on the size of the document you are uploading - this may take a few minutes. You should always upload your slides in advance of the event start time to ensure they upload successfully and you have checked the content. For Scheduled Replay and On Demand events, follow the same steps to upload your .mp4 video file. You will see media upload buttons rather than slides upload buttons. The 'Start' button loads and readies slides for broadcasting live events. The audio is also connected which can take up to a minute note: this will not broadcast the slides to attendees, this loads the slides ready for you and your presenters to view. Once clicked, any other users logged into the studio and viewing the Media Hub will see the start button displayed as/change to 'Join'. They will need to click this to see the presentation slides. If you have not uploaded any slides to your event and click the 'Start' button you will get the option to either upload/attach your slides or use a WorkCast default slide deck. This default slide deck has a mixture of single full width image slides and short generic video loops incase you wanted to do an audio only event without uploading your own presentation slides. The Audio Status light will display when slides have loaded showing that audio is connected to the studio. At this stage you are able to test your audio by dialling into the phone bridge and ensuring you can hear yourself through the Media Hub slides window. This should be done prior to broadcast to ensure that your sound is suitably clear. You should unmute the play controls in the video window to test your audio. At the designated start time of your event, click 'Broadcast' to begin streaming your content to your audience. A confirmation box will initially display to ensure you are ready to broadcast the event. When 'Proceed' is clicked, a countdown will initiate and your broadcast will display in the event auditorium after the countdown is complete. Please note we always recommend starting exactly or 30 seconds prior to your exact event start date. If you start the broadcast late your audience may begin to drop off and leave the event page. Presenters are unable to initiate the 'Broadcast' process. This should be done by the Host or Producer licence holder. Presenters can however navigate through the slides once broadcast has been initiated. NOTE: The 'Broadcast' start is also used as the start point of your event recording. The media window displays the current slide of your presentation. NOTE: Each click will move to the next transition (much like viewing within PowerPoint) meaning, if animations are present within slides, the next animation will play. The buttons will turn green when you first click on them to show they are active. When green, you are able to use the left and right keys on your keyboard to transition (a clicker can also be used). When clicking elsewhere (e.g. 'presenter chat), the buttons will turn orange meaning they are deactivated. Click on the buttons again using your mouse to reactivate them. This will reset your slides and move to the first slide in your presentation. This can be useful when you want to show a title or cover page. Note when this happens you will see a short loading graphic as your slides re-set themselves. The counter displays which slide is currently active and how many slides are included within the presentation. Pressing this will stop the event stream broadcast for all presenters and attendees. This is generally only used at the very end of an event. This will also end the event recording. Presenters are unable press 'Stop'. Once you have started your slides you will see static images of the presentation to the left. This shows the current slide and the next transition (what will display after the following slide is selected). You can also use the thumbnail images to move to specific slides within the presentation. Allows all presenters to communicate via text during the event. Presenter Chat is available for all studio users and is not visible to audience members. This shows all activity that the WorkCast studio manages during an event. This is used by WorkCast Technical Support and you do not need to view this section. 'Use Cursor' and 'Show Cursor' can be activated to allow you to interact with your PowerPoint to start videos or animations within the deck not set to autoplay/autostart. Locking the slides in your presentation allows only Hosts or Producers to control the slides. Slide transition buttons for Presenters will be deactivated. This allows you to view a static image version of your presentation in the large play window rather than the live stream. Videos and timed transitions will not play in this view - the audience view will remain unchanged. Note: WorkCast has a Flash option as a fall back to our default streaming that does not require Flash. If you are using an older browser version that can not be updated and does not support latest streaming technologies you may see the 'Use Flash' option made available above your presentation window. You would need to ensure your browser settings has 'Flash enabled' which should then load the slide presentation in a Flash enabled view. Polls are created during the event setup. When polls exist for an event, they will appear in the Event Polls pod. You can move between polls by clicking the large arrows at either side of the pod. If these are green then they are active. Each poll questions initially only has the ‘Ask’ button available. When clicked, this will send the poll question to the online audience. One you have pressed ‘Ask’ a ‘Get Results’ and ‘End’ button become available. Get results will pull back all the known responses at that time and provide a pie graph of the results, showing percentages and numbers for the results. You can continue to press Get Results to refresh your results view. The End button closes the poll and it will no longer gather results from attendees. Once you have used Get Results, the ‘Publish’ option is available. This will publish the pie graph results to all the attendees of the event. Attendees see the pie with percentage results only. All results are available post event in the reporting pages. Find out more about Polls here. All attendee questions appear here for presenters to view. A section to 'Ask A Question' is included as part of the auditorium build but can be disabled if not required for specific events. A more detailed explanation of this pod can be found here. It is possible to include 'Participant Chat' as an alternative to 'Ask A Question'. The Attendee Chat pod allows you to post messages and also delete any posted messages. 1) Attendees can freely communicate between each other within one chat window. 2) Messages to individual attendees can be sent allowing you and the attendee to communicate privately. Find out more about Attendee Chat here. This section is an extension of the presenter chat in the Media Hub and allows presenters to have private conversations and start chat groups with other presenters. Users are notified of any new chat messages appearing with a notification at the bottom right of the studio page. This shows you specific event session information including title, start date,duration and timezone. This ensures you can check you are in the correct event session studio section before applying a send command or lock feature. Enter the desired URL in the bar provided. You will be asked to access and check the URL before proceeding - you can only ‘proceed’ once this step is complete. This option is often used for post event surveys. This will redirect anyone on the live event page within the same tab/window. Text entered within this section can be displayed to all attendees on the event page via a pop-up box. You will be asked to confirm the message before proceeding. You can lock your event auditorium page to disable attendee access. This can be set manually or scheduled. When a page is locked, attendees will see a message prompting them to return at a later date (this can be edited and personalised). You can gain access to your 'locked' pages by entering a unique Lock Bypass Key which is displayed within the pod. Scheduling locking and unlocking your event page allows you to set specific times frames where attendees can and can't access your events.